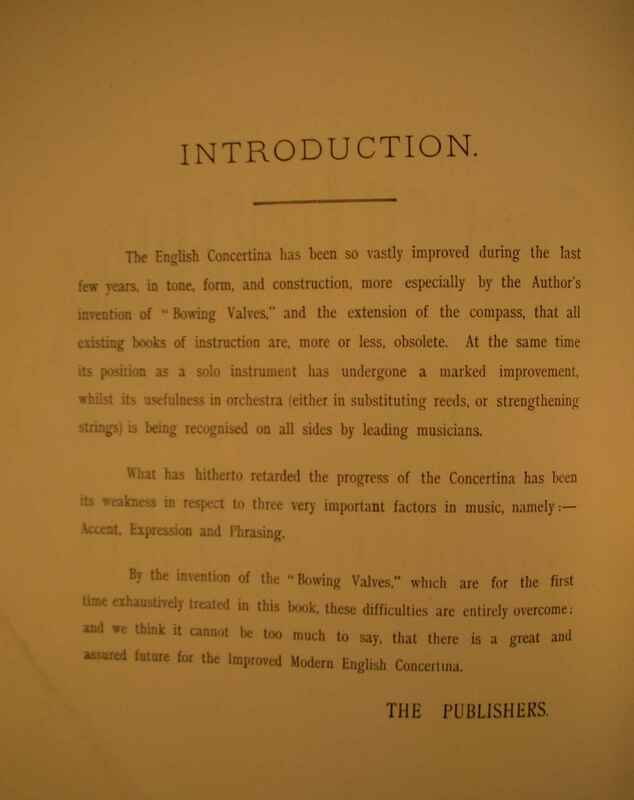 Full Description: ‘English’ Concertina Tutor: “ The Modern English Concertina Method by Signor Alsepti, Published by Lachenal & Co, London W.C”. Originally published by Lachenal & Co., London, W.C., c.1895. This tutor refers to him on its frontispiece as “Signor Alseptis” A self-proclaimed pupil of Giulio Regondi, (see Item NC.5.4.1-018 for a Regondi concertina Tutor) ‘Signor’ James Alsepti was a well-known concertina performer and teacher. An 1888 advertisement indicated that he played for parties and dances and gave daily performances and lessons at Keith, Prowse & Co.
Alsepti was one of the inventors and a major proponent of “bowing valves”: these were concertina air valves for simulating the phrasing of the violin’s bow. In the language of his tutor, expansion of the bellows is a “down bow,” compression an “up bow,” and playing successive notes without a change of bellows direction is playing “in one bow.” Lachenal & Co., publisher of Alsepti’s tutor, was primarily a manufacturing firm that made thousands of English, Anglo, and duet concertinas from about 1850 until it closed in 1935. On the firm of Louis Lachenal (c.1821-1861) and his early association with Wheatstone & Co., see Stephen Chambers, "Louis Lachenal: Engineer and Concertina Manufacturer, Part 1,". The Free-Reed Journal 1 (1999): 7-18. The bowing-valve patent(“Improvements in Concertinas,” July 8, 1885; Patent No. 8290) was granted to Alsepti and Richard Ballinger, an employee of Lachenal & Co. – Ballinger was still at Lachenal & Co when Tommy Williams joined the firm in the early 1920s. 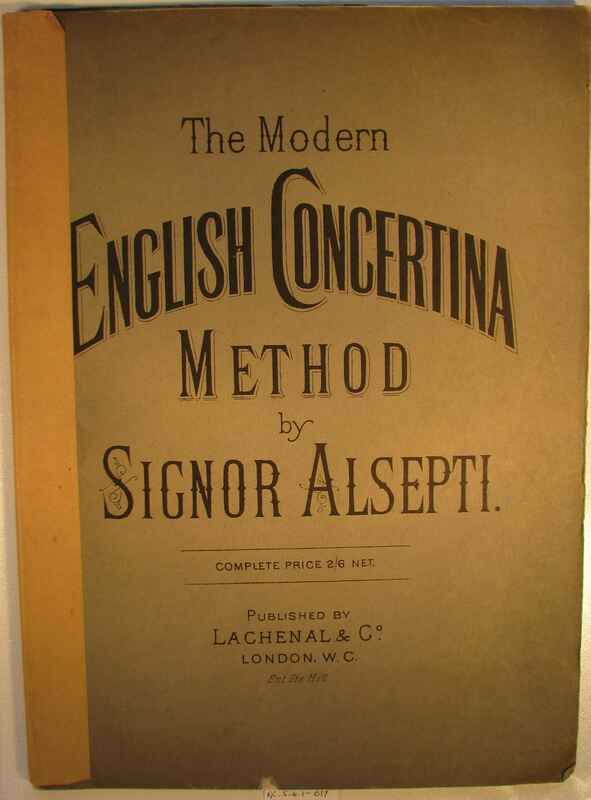 For further information on Alsepti, see Allan Atlas, “Signor Alsepti and ‘Regondi's Golden Exercise’,”Concertina World: International Concertina Association Newsletter (forthcoming). The Alsepti tutor was also published, somewhat later, by Carl Fischer, New York. [notes from the Merris paper].